Separate the tags on the micro perfs. 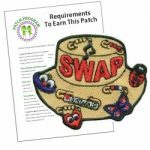 Write your SWAP information on the back. Open the pin and slide on one silver and one gold girl charms. Finish by poking the tag through a tag or use a hole punch. Close pin. 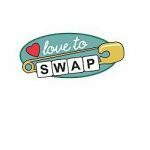 13 reviews for "Make New Friends Kit for Swapping"
This was great My girls loved it. Just wish you would get some new stuff in. The pins are very easy to assemble. The little Silver and Gold “Girls” are adorable. and a good weight. We used them at our rededication ceremony. If you want the pre-printed tags to last longer, you might want to laminate them. All of the girls liked them. Some make an extra for their moms. Absolutely loved these swaps. I did laminate the cards, though, but other than that they were perfect for what we needed. The product exceeded expectations, the charms had a nice, heavy weight to them. The instructions were easy to follow, and my Brownies had no difficulty assembling them. I needed them quickly, and their company always does a fantastic job communicating with customers. They go out of their way to make sure the customer gets what they need, and are happy. I will be shopping with them for a long time! Quality of product was great! I added split rings to each girl charm so they would face forward when hanging and not sideways. These SWAPS were very easy to put together for my 1st grade Daisies. 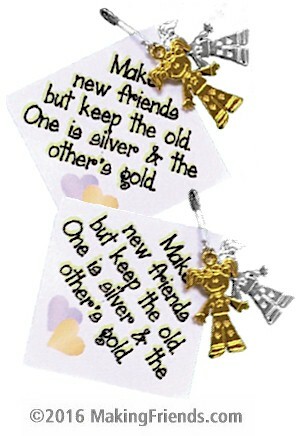 The coiless safety pins are sturdy and the silver and gold charms are very cute, even the girls said so. 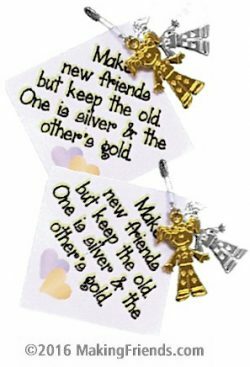 I liked that the safety pin was gold instead of silver, a nice and different touch, but they were too long for these SWAPS. Putting 6 small things on the long safety pin makes the overall look of the SWAPS less significant. This is a great SWAP for the troop to work for no particular event in mind. These will help introduce the idea of swapping as a way to make more new friends. Great price too! These were very cute and easy. My first grade Daisy’s gave them as gifts to the new kindergarten Daisies. Very good deal on these. So sorry about that.We’ll get those right out tho you. Customer Service was excellent. They were able to fix this problem before the event I needed these swaps. Thank you. Really cute and really easy!